This Sunday, Austria will host one of the most important races of the season. 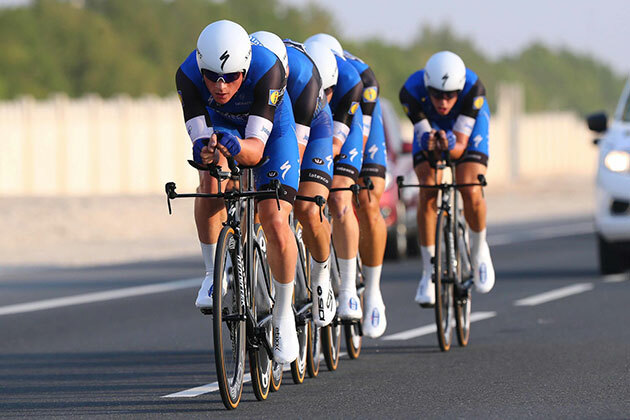 For one last time, the trade teams will battle for glory and medals at the World TTT Championships, scheduled in Innsbruck, and Quick-Step Floors – the only squad to have won the event on three occasions (2012, 2013 and 2016) – will field an outfit consisting of three former winners – Bob Jungels, Yves Lampaert and Niki Terpstra – who will be joined on the start line by neo-pro Kasper Asgreen, Laurens De Plus and Maximilian Schachmann, all riders who have impressed in this season's races against the clock, be it at the Nationals, in Grand Tours or at the European Championships. Sports director Tom Steels, the man who guided the team to an impressive haul of five medals between 2012 and 2016, shared his opinion on the route of the 62.8km race – the longest since the discipline was introduced at the World Championships, six years ago – which will take the teams from the Ötztal valley to Innsbruck. "It's a challenging course this year, starting with 40 kilometers of flat roads, where you really need to have the big engines that can drive a high speed. After this long section, you tackle 5 kilometers of climbing, which means the guys need to be able to hold on uphill too – and we even need to have a few guys who can set a high tempo. Our roster is therefore a balance between riders who can go fast on the climbs on a TT bike and are quite strong on the flat as well, and heavier guys, who are very good on the flat and will suffer more uphill. It's not a very technical route, but after the hill, especially in the last 5-6 kilometers, we will face sections with traffic islands and roundabouts, which require more focus from the guys to keep a good rhythm in the relay. 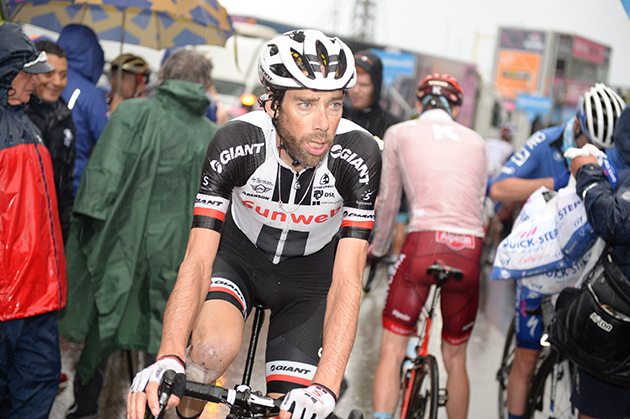 It will be fast though and we will have to go flat out after the climb until the finish." Valkenburg, Florence and Doha have an important thing in common: all three have witnessed a Quick-Step Floors victory at the World Team Time Trial Championships, and Tom Steels hopes that Innsbruck – a former center of European politics and culture and two-time host of the Winter Olympics – will be added to the list on Sunday afternoon, although he is well aware that the competition will be a fierce one. "The Worlds TTT is a discipline that means a lot for Quick-Step Floors, we have won it three times and have always been up there in the top, so of course we hope we can finish with a strong result in what will be the last edition for trade teams, although we know it's not going to be easy", explained Steels. "We have a solid roster comprising riders who rate this appointment as one of the most important races of the season and are ready to give everything out there. It's a pity that the time trial for trade teams is coming to an end, but we are motivated for this final edition and we will go for the best." Mitchelton-SCOTT are excited to announce the signing of talented 25-year-old Dion Smith for the next two seasons, complimenting the team’s versatility. The rider from New Zealand has displayed huge potential in his short career, from finishing consistently high in bunch sprints to wearing the polka dot mountain’s jersey at the this year's Tour de France, which leads head sport director Matt White to believe that Smith 'is ready for that next step into the WorldTour'. Having spent the past two seasons riding for the Pro Continental team Wanty-Groupe Gobert, the rider from Taupaki, Auckland joins Kiwi compatriots Jack Bauer, Sam Bewley and Georgia Williams. "We were looking for a versatile guy and Dion is a pretty versatile character. He can do a bit of everything, he can handle himself in the flemish classics, he’s fast but not a pure sprinter, he can climb good, he is a real racer. "This will be his first WorldTour team, he has been with Wanty-Groupe Gobert for a couple of years after One Pro Cycling and I think he is ready for that next step into the WorldTour. “He has obviously done two Tour de France's but to be regularly racing stage races in the WorldTour will be good for him. I think he will fit into our team very well, a lot of the guys already know him." "Reaching the top level in professional cycling is a massive goal of mine and now I am 25 and about to sign for a WorldTour team, but not only that, with the team that I've aspired to be a part of for years being a rider from the Southern Hemisphere. Mitchelton-SCOTT has always been an exciting dream. "The last two years with Team Wanty Groupe Gobert has provided me with vast amounts of experience and opportunities in the biggest races on the calendar. It's been a great stepping stone and important for my career. "I'm stoked to be on a team with lots of guys I look up to and that I am mates with too. Daryl Impey is a rider I am looking forward to learning from as he has so many years on me and has progressed in to a world class rider. I think Michelton-SCOTT has helped him become the rider he is now and I see myself becoming a similar rider to Daryl. "I'm looking forward to using my versatility not only for myself but the rest of the team throughout the next two seasons. I can't wait to get stuck in and pull on some new colours." Laurens ten Dam is the latest rider to join the growing Continuum Sports roster in 2019, bringing a wealth of experience with 16 years as a professional to his name. The 37-year-old will be the team's sole Dutch rider, adding to the long list of nationalities that contribute to the international composition of the team. Ten Dam is excited to add a new chapter to his cycling career after spending the last three seasons with Team Sunweb. "I wasn't necessarily looking to change teams but I'm not afraid to change, I've done it quite a few times in my career, and this was a good opportunity that presented itself. I really welcome the chance for a carte blanche, a clean slate, and to join Continuum Sports with some new goals and opportunities, as well as having some more freedom," ten Dam said. The EF Education First-Drapac p/b Cannondale team is proud to announce that Hugh Carthy has re-upped with EF Pro Cycling, extending his contract for another two seasons. Carthy recently finished third overall at Colorado Classic, where he also won the mountains classification, took fifth overall at Tour of Utah and has recorded top 10 finishes on climbing stages at Tour of Britain, Tour of Utah and Volta Catalunya.